The GLD arrived on Monday, one week before our Christmas Eve service. I unpacked it on Tuesday, just in time for a frazzled rehearsal soundcheck. Patching the board was quick, but the touchscreen needs to be finessed a bit when dragging and dropping. With Allen and Heath, you put any fader anywhere you want it, including mix sends and master faders. It was easy to lay out channels the way I wanted them, and I was able to fit most of my inputs across the top layer of both banks. That way, I could use DCAs if I wanted, but I could also just leave everything up to grab quickly. Everything “fit” very well within the 20 faders and the layout was logical to use. One of the first things we tried to do was attach a USB keyboard to make the naming and patching go quicker, but we discovered that the GLD forces you to use the on-screen qwerty keyboard. It’s about as easy as texting on an iPad. Our unit arrived with the 24 channel snake unit and one 8-channel expander. These stage racks are just the right size for our church, letting me put 24 inputs behind the stage and 8 more on a drum riser. That’s some nice physical flexibility, and the 12 outputs gave me just the right number of aux sends. As far as sound quality, I was impressed. There was an unmistakable improvement over our 1993-ish analog GL4 console. There was certainly more clarity in every channel, and even my playback tracks sounded better. The processing feels very “standard”. There’s a comp, gate, and 4-band EQ on every channel. I have no complaints about any of that, however I was expecting a little more in the way of FX processors. There is only one delay plugin, with different “presets” you can choose from, but I did not see a way to change the delay rhythm (triplets, for example) and while it sounded good, it felt like it could use more “character”. The Pro1 arrived thursday afternoon, just in time for our next-to-last rehearsal. The guy bringing the rig also brought a Midas DL rack (48 in and 16 out) and a recording setup to play with. My mind had turned into mush by the time he was done patching it. The interface is so easy to get lost in, and its not always clear what the rotary knobs should be doing, or why they aren’t doing anything at the moment. But once it was configured, the console was entirely mixable. I do like mixing with POP groups, though there are times when I would rather see more than one thing at a time. It certainly sounds great, and it feels like the processing has more life and character to it than the GLD. However, it was cramped-feeling. Mixing on only 8 channels at a time is fine until you need to do 3 things at once. Then it quickly becomes a game of “where is that button?!”. Like all the other Pro models, there is a trackball and yes, you do need to use the mouse for a lot of things. However, I thought that the trackball itself was probably the best one I’ve ever used. It is “stiff”, so to speak, so it is easy to control. What I did not like was the click button placement. I am used to using my thumb to click on a track pad. This is impossible when the click buttons are above, not below the trackball, so you are stuck using your fingers to click. You may connect any USB mouse or keyboard to the console, and the model I had was in a flight case with a built-in keyboard tray. It is important to note that while you do need to mouse around configuration screens, all the actual mixing is done with the console’s physical controls. I had a few issues booting the console, such as needing a power cycle once when the outputs weren’t passing audio. This may have been due to the funny clock situation I was in, though. The AES50 connections needed plugging and unplugging more often than is comfortable, but again that may have been due to my specific situation with network bridges and the MADI interface for the recording rig. The consoles are in the same price point, in fact they are just about the exact same price. They have some feature trade-offs between them, though. Here are some comparisons between feature sets. 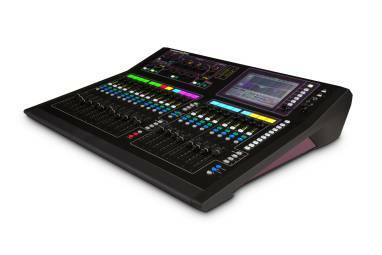 The GLD is designed for a remote rack, with only 8 inputs on the surface. This is great news if you want to ditch analog snakes. The Pro1 has 24/24 I/O on the surface, with optional (expensive) expander racks. This means that the console works right out of the box all by itself, but you can add more channels to get 40 mix inputs. The A&H guys hit a chord with me for putting 4 RCA inputs on the surface. In fact, for christmas, I used all the RCA inputs and the 4 XLRs without needing anything more at FoH. The Pro1 loses points here for only having XLRs, since I needed to scrounge for DIs last minute and ended up running my aux sources in mono to save channels. The GLD has a sporty frame with angled corners. It features the same soft-feel black plastic that comes on Thinkpad laptops, and that earned points with me. Everything is laid out thoughtfully, although it is weird that there are so few buttons on the surface. This means that you have to interact with the screen quite a bit, and you end up paging through menus to get what you need. The 20 faders give it a “just right” feel. It is small enough that you can stand in one place, but there are enough channels that you can have what you need in front of you. The Pro1 is a design atrocity. It looks like it was conceived in 2002, and is all curvy and bulbous for no good reason. It is a clutter of blinking lights and buttons, and it takes a good study to get to know what everything does. This leads to the console feeling cramped, not because it is too small, but because there is just so much available. This was compounded by the fact that you can only mix one group at a time. The Midas way of mixing is to assign every input to a VCA (there are 8 ) or a POP (there are 6). A POP is just a VCA without a master fader. The VCA faders and POP buttons are all on the right-hand fader bank. When you want to mix an individual channel, you punch the VCA or POP button, and it “spills” over on the left-hand fader bank. In this way, you always have access to all your VCAs and all your POP groups, and can have any one group spilled over at a time. But it gets funny with small channel assignments. A VCA with only 3 instruments in it means you are wasting 5 faders on the left any time you are mixing that VCA. The GLD lets you always have 20 things up and mixing at any moment. After mixing on it for a while, I learned to like the Midas style of mixing and I didn’t miss the extra faders, but it is certainly disconcerting at first. The GLD allows you to mix while you make changes to an input strip or do anything else (patching, naming, setup) on the touch screen. But the Pro1 is very single-tasked. You can really only do one thing at a time, since all the information is coming from the LCD screen. Sure, you can always move faders, but you wouldn’t be changing an EQ while editing an effect patch. This sometimes translated into having to interrupt my work on something (like an FX or automation settings) when a musician needed a monitor tweak. You sortof have to drop everything in the interface to see what you’re doing. Curiously, the GLD does not display a number for the fader’s position. There are screenprinted numbers on the surface just like any console, but the screen never tells you what level the mix is at. I’ve been told that there is a button that lets you see a number, but I didn’t discover it while I had the console. This is consistent with the physical controls, which have lights to indicate position but don’t show you any numeric value. It’s not a particularly crucial detail, but it stands in contrast to the Pro1, which shows the fader’s dB level in large numbers as soon as you touch it. In fact, every control on the Pro1 is touch-sensing, and rotary controls draw a big box around the on-screen control that they are moving to make sure you know what you’re changing. The channel strip is very different between the consoles. The GLD has a horizontal strip with a knob for most things. The full EQ section is there (with a “push for Q” on one knob that was not very intuitive), and most of the dynamics knobs are there. The Pro1 has a vertical strip with knobs for everything and little buttons that bring a detail view on the screen. The knobs tend to share functions, with the “dynamics” section controlling both the comp and the gate, with arrow buttons to pick which. The EQ section has just 3 knobs, with those arrow buttons to pick the band you’re editing. This took some getting used to, but I don’t have a problem with it. Once you’re in a detail view of the input processing, touching any knob in the channel strip will display the view for that function. EG, if you’re looking at the comp, touching the EQ knob switches you to the EQ view. The input “channel strip” has more features in the Pro1, and the screen shows you things like Aux send levels and bus assignments, whereas the GLD only shows you that information in the “Routing” screen. The GLD has a flexible bussing system. You go to the config page and tell it how many Mono Aux, Stereo Aux, Groups, and Matrixes you want. It then tells you how many you can actually use, based on its output and mix bus limitations. In other words, if you don’t use matrixes, you can convert them into groups or auxes without sacrificing functionality. It will do up to 20 mix busses, so that’s the limit for any one category as well as the combined total. The Pro1 seems less flexible at first, but it can actually do a little more. It has 16 physical “Aux” buttons, and 8 physical “Matrix” buttons. But it turns out that in Midas-Land, a “Matrix” is actually just an Aux, except you can mix other auxes into it. If you don’t use matrixes, pretend that the label isn’t there, and you have 24 Aux sends! Neat! But you can also set different modes for the “aux” sends, such as “group” and “mix-minus”, which are both fancy things that I don’t understand. Link 2 Auxes together and get up to 12 stereo sends. Both consoles come ready to go for an LCR mix. In the GLD, you have to tell it if you’re doing LR, LCR, or “LMR” before you can route things and start mixing. The Midas just shows up with an LCR mix and you can leave the C channel unpatched or not assign things to it. The way auxes mix is very different, too. On the GLD, every fader has a “mix” button alongside the “select”, “solo” and “mute”. You can mix an Aux by pressing “mix” on that aux. The board does a fader-flip, where each input becomes the send to that aux. You can also mix auxes by pressing “mix” on an INPUT fader, which turns the Aux masters into all the sends for just that input. This is the way I prefer to mix for sound checks, as it is very easy to dial instruments into everyone’s mix at once. The Pro1 lays out Aux masters on the master fader bank, but selecting them only gives you the output processing. In order to mix an Aux, you have to press it’s corresponding (and unlabeled) button, #1-16 on the upper part of the console. This means that instead of seeing the label that you have set, you need to know the number that each Aux corresponds with. After pressing the button, the board does a fader flip and your input faders become contributions to the Aux. However, this is the only way of mixing auxes. There is no way to mix all the aux sends for a particular input channel at once. The Pro2 has a bank of 8 knobs to give you aux sends on the selected channel, but these are absent in the Pro1. That flies in the face of my sound check method, and is a little bit slower for some situations. It also means a lot more flipping through channels, adding wear and tear to the surface. For Christmas, I had an upright bass with a crummy pickup on it. There was no way the parametric EQ was going to cut it, so I wanted to add in a graphic. It turns out that the GLD only has GEQs as part of the output busses. The only way to put one on the bass was to assign its channel to a group, and then assign the group to the L/R mix. This seemed like a waste of a group bus to me. When I went to the Pro1, I originally thought it couldn’t be done either, but it turns out that one of the FX processors is a dual-31 band GEQ. They can be patched anywhere in the console, including a mix channel’s insert. The crummy part is that the insertable GEQs will not work with the GEQ FLIP button, meaning you can’t use the faders to tweak the EQ. Instead, you have to use the rotary knobs, 8 at a time, which is really annoying. Luckily, like everything else, you can save presets of your work and copy/paste at will. The Pro1 has a nice “Global Tap” button that can be assigned to any or all of the FX processors. However, the tap button itself is crummy. I had a hard time getting it to actually hit the tempo I wanted. Sometimes it gave me half-time of what I wanted. Strangely, the light that flashes on the tempo is among the options that the board has for “LCD brightness” and whatnot. You can tell it to only flash once after you hit it, or never flash. If you’re easily distracted by flashing lights in the corner of your eye, that’s a slick detail for the Pro1. The GLD has no tap tempo button, but any of the 10 soft keys may be assigned to ONE of any FX processors. This means you can have multiple different taps going at a time, which is flexible but mostly pointless. If I had 3 different delays going, I wouldn’t want to waste 2 more soft keys on tap-tempos. The GLD faders are okay, but they are a lot like the Yamaha faders I remember from 10 years ago. When you recall them, they zip to their location with a familiar scraping sound. If two faders are linked, the following one kinda bumps around all jittery-like. The Pro1 has much nicer faders that are smooth to move and also more “reserved” when they recall. They slide up a little slower and a lot quieter than the GLD. They also don’t to the jittery dance when moving as a linked pair. The GLD is very clean, and I can’t say anything bad about it. The Midas is smoother, maybe a bit more mellow. I don’t have much experience with Midas gear, but it seems like the “analog gain + digital trim” split gain controls are supposed to let you dial in how much “Midas” you want in your sound. Nevertheless, the GLD is a 48kHz system and the Pro1 is a 96kHz system, so take that as you will. The GLD will work with any I/O card already out for the iLive line, which means you can pop a Dante card in there and be off and running with 64 channels both ways. These are managed in the “Patching” screen, on their own tab. I did not have a card to try with my demo, but it seemed straightforward, and there was a setting that lets you pick clocking options for that card. You can get digital signals (Ethersound, Dante, MADI) out of a Midas, but you first need a $900 rack-mount box and then a third party card (another $900) for whatever you’re converting to. The console itself only supports Midas’ AES50 protocol, so you’re kind of in a corner for getting things into and out of it. The rig I demo’d was converting to MADI and then went into a mac pro for 48 channels of recording at 96kHz. You can also get PCI-E cards from Lynx which take AES50 straight off the board, at 24 channels each. The I/O is set in the patching page as “tape returns” on the input channels. Each input channel in the console’s patch has two inputs, the “normal” and the “tape return”. You patch physical mic preamps to the normal input, and your virtual soundcheck I/O to the “tape return”. You also have to double-patch the physical inputs to your digital outputs. Then there is a global setting in the “preferences” menu to turn on the tape returns so you can run your virtual soundcheck. Of the two consoles, I would consider the Pro1 as “More Complete”. It is, after all, part of the Pro range, and it inherits most of the functionality from its larger siblings. It has all of the same FX processors (just less of them) and the same routing and patching flexibility, but with a smaller mix-channel count and with fewer faders. Since it uses the same rack hardware, you know it has that Midas sound in its mic pres. The GLD is its own product line, and a strategically lower-mid-range one at that, so it doesn’t necessarily have all the bells and whistles you might want. Its scene functions are pretty limited and it doesn’t have buttons on the surface for recall. It also doesn’t currently have iPad or computer editor support, which almost puts it in a lower class than the Midas out of the gate. However, for a lot of situations, it is exactly what you need with no superfluous features to get lost in. That is my strongest feeling about the comparison, especially for my less-technical volunteers. The GLD presents itself easily and the user manual is built-in for a super low learning curve. For a room with 300 seats, it is a fantastic fit. On the other hand, the Pro1 will sound and act like a console costing 3 times as much. The downside is that there is a lot to learn, but the advantage is that there is a lot to learn. My same less-technical volunteers would have a system to dive into and really get to learn, and spend time knowing the ins and outs. There is no “perfect console”. If I was buying for myself, I would go for the Midas, but I’m still not certain which console my church will go with. My volunteers all warmed up to the Pro1 more than I expected, and after mixing with Midas VCAs and POP groups, I really didn’t like the layered approach anymore. So while I’m leaning towards the Midas, I hope this comparison has been a helpful and unbiased look at two great consoles in the same price range. Enjoyed the article and your site in general. Dont agree with the outcome but that is really irrelevant. Where I am based the GLD retails for significantly less than the Midas Pro 1. It has just been installed at our HOW (2000 seated). Last year the GLD was used on loan for a Worship Festival with 15 bands, MC’s, dance troupes and 15 piece bands (just gotta have the fourth guitar and violin). Set up and storing settings was easy and although there was zero time for sound checks the end result was acoustically very good. Interesting article. We recently bought a GLD-80, but our shortlist came down to the GLD and a Pro2C. In the end we bought the GLD not just on price, but because it was easier to use than the Midas – all my team are volunteers. Also, the Midas lacks user access controls that the GLD has, which was important for us since our facilities are used by outside people from time to time and the ability to provide a locked down ‘guest’ user is very useful. What do you lock out in your guest account? Just patching? The midas stuff stores everything in the show file, so you can always recall everything, but you wouldn’t be able to save a guest from getting confused and messing things up for himself. I was really surprised that all of our volunteers liked the pro1. It’s complicated by nature, but once you have it where you want it, the mix goes very easily. The GLD-80 allows you to assign a mandatory scene to a login. Our guest user gets a scene with just a master volume, CD player and two radio mics. Pretty much all other functionality is locked out. This means that external users can do simple meetings with little support. For other users, I will probably add some additional logins that just restrict things like patching. I just haven’t got around to it yet. My impression when evaluating the two desks was that the GLD-80 was aimed squarely at the church market (among others), so things like access control are included. 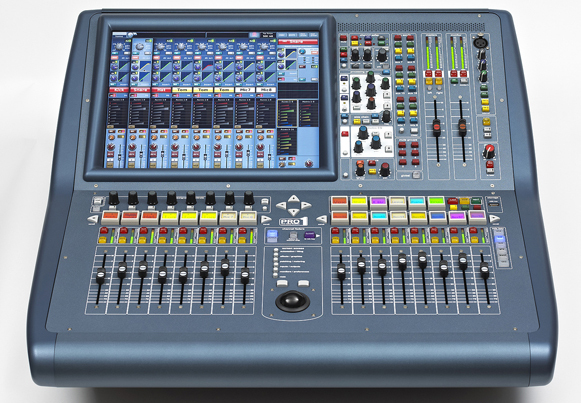 The Midas is a more “professional” desk, and so features like access control and USB recording and playback are not needed. On the other hand Midas has a more absolute commitment to reliability with things like redundant connections between the desk and the stage box. In the end the GLD won on those smaller features and on cost – we were able to spend more money on our speaker upgrade. It also has a much less cluttered surface in my opinion, which is helpful since all my team are volunteers. I nearly forgot, one other requirement we had was the ability to do multitrack recording – the Midas solution (the DN9650) ends up being quite a bit more expensive. I guess with Behringer using AES50, more AES50 compatible equipment should become available over time, but at the moment options are quite limited. Oh, the “only what you need” is a great thing to have for events that just need a mic or a CD. We generally don’t do that kind of stuff in our room, and when we do we always have a regular sound tech involved. I totally agree about the “church” vs “pro” markets, it’s the exact impression I got as well. My midas dealer has a product which interfaces AES50 into Thunderbolt, which gets you 48 channels at 96k for about $2k. So that is the route I would take rather than the super-expensive klark-teknik recorder. The pres are better in a Midas board. As an installer I’ve installed both mixers and there big brothers. Allen and Heath has won me over hands down. Plus a&h has done firmware updates that addresses a lot of the simple issues. Not sure on you market but here in Michigan, the GLD is about 2,500 less than the Midas. All the time to fumble around and train someone to use the Midas cost the customer money. The Pro1 is very bulky and not fun to mix on. Where the GLD was fun. Well that my 2 cents. I’ll disagree on the fun factor. The pro1 was more fun for me. GLD felt a bit more mechanical. But then again the “midas way” seems to be fairly polarizing. I loved not having to create and subsequently remember layers for my mix. Great review I am having trouble deciding from these 2 boards. on what I have read quality pushes me towards midas but price towards GLD I dont need digital snake although stage box might be a good feature for future. In UK Midas Pro 1 no stage box £9000 a third more than GLD with 1x AR2412 & 1x AR84 about £6000. No mention of the RTA function in the GLD which is very helpful. Or the histogram in the dynamics, also very helpful. 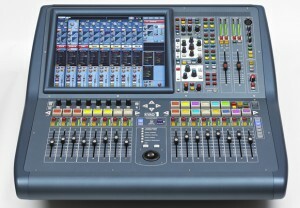 Or the ME-1 personal mixer for the GLD, or the compatible Aviom split from the stage box. Or the included AES/spdif I/O on the surface. The GLD has an iPad app, and off-line editor now. There can be more than one on-line at a time also. I’m sure I’m forgetting several other feature differences still. But for a church, there’s no argument that gets the pro1 even close to the value of the GLD… The Pro1 is for touring engineers, and only for touring engineers. The GLD is extremely user friendly, yet versatile enough for seasoned pros, and it’s flexibility/expandability at the price point is unmatched by anything on the market. A little late to the party – I just stumbled across this. The reviewer forgot one handy Midas feature: The Extend button. This changes the eight mix faders into channel faders, so that one has access to sixteen at a time. I found the Midas to be a ‘why?’ until I learned how it worked. Now I like it. It’s not perfect though. One gripe is having only three EQ controls that one must toggle between (though I’m used to this as I work on an LS9 a lot). The other is that one cannot select Pre-EQ aux sends. Regrettably, I don’t have sufficient familiarity with the GLD to present any particular likes or gripes. It certainly looks to be a very good console and a good value. So a question – worth the Midas $3.5k more? thanks a ton for the thorough review! my church has a Pro2 and are considering switching to the GLD, so this is quite helpful.